Daddy can see us…when he gets here. Do you fancy a movie along the lines of “Hush” but with people who aren’t mute? In short, a film in which there’s a lot of screaming. And should there be co-stars who are simply mown down with a wicked-looking ax as in every “Friday the 13th” episode? Then “He’s out there” might be something for you. However, if you are someone who expects a little explanation about why someone is terrorizing a family, then I’ll have to disappoint you. Why Laura (Yvonne Strahovski) and her two daughters Kayla (Anna Pniowsky) and Maddie (Abigail Pniowsky) were suddenly attacked by an unknown, still remained a question mark in the end. And again a cabin in the woods. “He’s out there” certainly isn’t a bad movie. The increasing tension ensures that you’ll be sitting on the edge of your chair. It’s a bit like “The wolf and the seven young goats“, only the wolf is a lurid disguised person and the 7 goats are played by two irritating screaming girls. Now such a disguise as the maniac uses is nothing new in the slasher genre. Jason Voorhees had a hockey mask. Michael Myers a scary rubber mask. Leatherface wore a mask made with the flesh of his victims. The perpetrator in “He’s out there” seems to be a cousin of “The Collector” in “The collection“. Almost an identical disguise and the same used clothes. A disappointing, simple, third-rate film.. I like to watch such a typical slasher full of screaming victims. The least I expect though is a surprising denouement or a unique thought up slaughter as in “You’re next“. But in this film, the standard list for slasher movies is neatly checked off and there’s no deviation from the standard formula. And then there’s also the fact that there are just a few victims and nothing (but absolutely nothing) of background information is shared. That makes “He’s out there” just a disappointing, simple, third-rate film. Even the end was so predictable that I had to sigh deeply. And to be honest, I also thought the denouement was a bit exaggerated. Let’s hope there won’t be a sequel. Is there something positive to report? Yes, there is. Yvonne Strahovski. And not only because she looks nice. She tries in a realistic way to give shape to a character who’s terrified and at the same time tries to protect her two panicky children. So expect a lot of hiding and running away while screaming. Kind of stupid though. Because the person who wants to hurt them, always knows where they are. 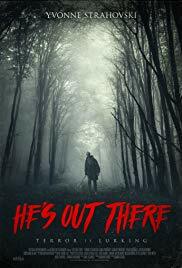 “He’s out there” is like an ex-girlfriend. It was fun for a while, but then it turns out she wasn’t so special. And before you know it, you are glad you got rid of her. And in no time you are looking for someone else and you have forgotten about her. Let’s hope they aren’t planning to make a sequel.